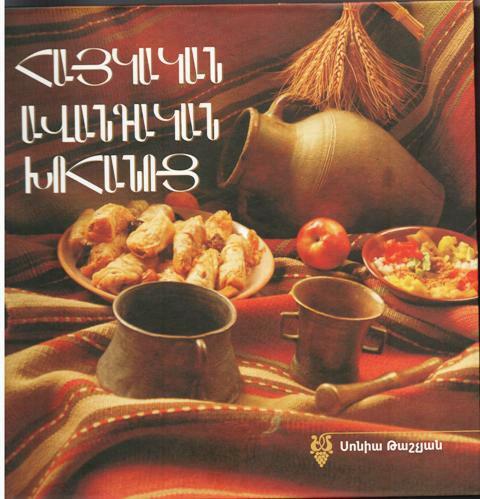 Do you recall my request for a volunteer to help translate into English some of Sonia Tashjian’s recipes from her new cookbook, “HAYGAGAN AVANTAGAN KHOHANOTS” - “Armenian Traditional Cuisine”? I’ll bet you thought no one responded, right? An avid reader of The Armenian Kitchen, Ara Kassabian, spoke up immediately, and has already translated, prepared, and photographed the first recipe. Sonia and I couldn’t be more thrilled with Ara’s willingness and great effort in this collaboration. We thank Ara – humbly and profusely. FYI: This project is a global effort – I live in South Florida, Ara is from California, and Sonia resides in Yerevan. Even though the three of us have never met face-to-face, we've developed a strong bond through this website. Here is the first recipe translation from Sonia’s new Armenian cookbook. We hope you’ll like it. 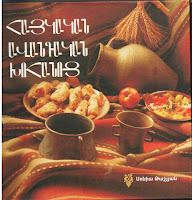 "Aghamagh" belongs to the rich culinary tradition of Marash. In the summer, when people used to core eggplants and dry them in preparation for usage in "dolmas" (stuffed vegetables) during the winter, they would dry the removed cores separately by threading them with a needle and hanging them to dry. They would then use the reconstituted dried cores to make this unique salad, particularly during the Lenten season. To reconstitute the eggplant, they would soak it in water for 24 hours, then, having changed the water, they would boil it. After draining the water and letting the pulp cool down to room temperature, they would add the sauce, along with the other ingredients. To dry eggplant in your kitchen, peel it, cut it into cubes (about 3/4 inch), salt it, and put it in a large sieve to dry in the sun. You can then store the dried eggplant in a cloth bag, with an added handful of coarse salt. It is possible to approximate the taste of dried eggplant by cubing or slicing a peeled eggplant, sprinkling it with salt, and placing it in a colander to drain. After a few hours, the eggplant is squeezed by hand, then sautéed with a bit of water or oil. 1. Prepare the eggplant by cubing, salting, draining, and sautéing, as indicated above (or use reconstituted dry eggplant). Let it cool to room temperature. Arrange on a flat serving dish. 2. 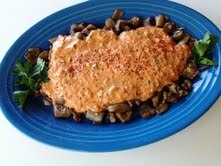 Dilute the tahini, tomato paste, and pepper paste with the 1/2 cup water. Add the remaining ingredients to the mixture and spread over the eggplant.